Here at G&S our aim is for the children here to have fun, learn to be creative and enjoy studying in English speaking and homely environment. 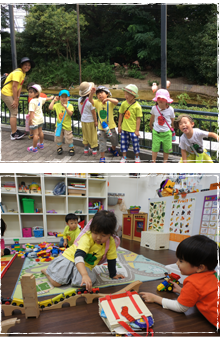 Our schools have dedicated teachers, both Japanese and foreign, who will take care of children, providing a safe and fun area to learn and play. As well as learning to speak English by native speakers, the children are encouraged to think for themselves, to create art, play music and participate in games, as to learn both independence and working in groups. Throughout the year various activities are organised to broaden the children’s awareness, from excursions to swimming and seasonal events. G&S classes encourage English to be spoken as much as possible at all times, which is imperative for your child’s English development. Classes are structured to include activities important for your child and to give stability over the years they attend the school. The complexity of language taught and expected of the children during ‘Circle Time’, ‘Writing’ & ‘Phonics and Reading Time’ is appropriate to the children’s age, understanding and ability. The curriculum is based of interesting themes over the year and are designed to stimulate your child’s interest and to coincide with field-trips and annual events. Children start International Preschool from 1 years and can stay until they leave for elementary school. In this time we try to prepare them as much as possible with the necessary skills for school life and to teach them English. 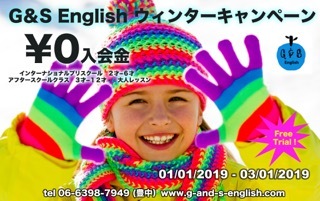 G&S English International Preschool classes are based on 3 age group ranges Kinder Cubs (1-2yrs), Kinder Searchers (3-4.5yrs), Kinder Kings (4.5-6yrs). Goals differ for each age group, and also for each child. As all children are different and all learn and develop at different speeds, classes are kept small to identify the areas which each child need more or particular attention. Taking the first steps to separating from Mum for the first time. Learning to trust the teachers and the new environment around them. There is much to learn as children, move from home to a school environment. Here they will learn to sit on chairs and focus on the teacher for a sustained period of time. Learning daily routines. Toilet training. Motor skill development , using pencils, crayons, scissors and other apparatus for perhaps the first time. Understanding a new environment also requires understanding new rules. Inside the classroom and outside walking to the park, the students will learn about safety and to appreciate the environment they inhabit. Learning about politeness and etiquette is also very important. Understanding it is important to conduct yourselves during play time, learning time, how sit and eat at lunch as well as throughout the day are important rules of behavior to learn. Safety, of course, is of the upmost importance, therefore the children will learn about road safety and also safety within the classroom. Our students will meet new friends for the first time, and here they will learn how to behave and respect others. Playing together, sharing and also helping each other through their studies will help them to grow bonds with their teachers and peers. engaging in conversation and asking and answering questions. From ABC’s to sight-words and flashcards. Phonics and reading student-reading books. Using workbooks which increase in difficulty as the children’s progress, they learn to read and write and color and understand the questions and instructions throughout the books. Learning to use hand-to-eye co-ordination, and using scissors, holding a pencil and to use chopsticks as well as being able to put on their own shoes etc. Solving problems through puzzles and games. learn basic skills from counting to making calculations, reading graphs and more. Learn about the world around us, history and cultures by our interestingly themed program. Art and craft time is a chance for the children to make something or express themselves through art, based on the the monthly theme. Being in an environment with native speaking teachers will allow the children to learn new words and phrases in a natural way, which can’t be taught from text books. The children’s listening will adapt to catch English spoken at a natural speed and will be encouraged to speak in English to their friends throughout the day, in all activities. As well as the fundamentals of a school curriculum, we try to go further to broaden the children’s inquisitiveness in the world around them. Through music time the children will learn to play simple songs on the piano, learn to keep a beat with percussion, make their own instruments, as well as being introduced to other new instruments played by invited musicians. Everyday we go to the park to exercise the kids legs, but twice a month we go on a Big Walk, for an extended length of time. Either to the library or for a picnic, or to somewhere connected to the monthly theme, these walks are enjoyed by all the children. 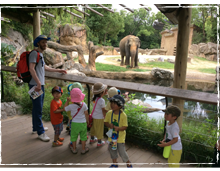 In addition, throughout the year we have special field trips, to the zoo, airport, butterfly garden etc. Each month the children learn some new songs connected to the monthly theme. The children love singing and dancing! In order for mums to be able to sing and dance with the children at home, we encourage you to join the teachers twice a month for Dance With Mums time. A brief period during the class when mums can come and learn the new dances with their children. The use of technology is also encouraged at G&S from a young age. Using electronic tablets as a learning tool is one way of learning how to use new apparatus. Older children will be given the chance to use the school computers, where they will learn to type, search and print. Children love to cook, twice a month we have cooking days where the children can learn to cook new foods, as well as learning about the ingredients and hygiene. The children are given a lot of freedom to express themselves through Art. Some activities will have a set goal, something specific we try to create, and other times the children will be given materials such as paint, clay, old boxes to use and create whatever they wish. At G&S English we have a proven curriculum that incorporates all the key elements for your child’s development, whilst we really encourage each child to be an individual, to make choices and to evolve at his/her own pace. Our daily schedule has been designed to be interesting and engaging for the children. Whilst including essential components for the children’s development, the focus of the curriculum is learning English and preparation for life. Meet and talk with your friends and teachers. Unpack bags, say goodbye to mums and get ready for the day. Good morning and welcome dance, and monthly themed dances. Asking and answering questions, learning new sight words, weather, numbers etc. Talk about the monthly theme. Regular toilet times and hand washing. Toilet training for your students with help from our licensed Teachers. Go outside for fresh air and exercise. Practice road safety and visit other interesting places, fire station etc. *sometimes Big Walks are scheduled, extended park time to visit the library or have a picnic outside. Lunch is provided by the school. Freshly cooked on the premises, the lunch is healthy and has been designed to introduce the children to an international menu. Or a bento service is provided. This depends on the facilities at the school and the number of students. We brush our teeth after lunch and gargle after trips outside. Writing time. The children work through their books at their own pace, assisted by the teacher. Making something to take home and enjoy. Individual work in their sketch books or working as a group, painting, drawing and learning to express themselves. Learning a new song on the piano and percussion instruments. Learning to win and lose and enjoy games with friends. “ Did everyone have a good day”? Let’s review the day and get a reward sticker in our daily report book. “See you tomorrow”!